David Rumsey (aka Map Darwin), a San Francisco based collector of maps, has collaborated with advertising agency Centric, to create a wondrous sim for all you cartographers, travelers, historians, artists, sculptors, and designers to gawk at. The build takes advantage of an avatar’s ability to fly; it's taken in from above or from floating within. Rumsey of course appreciates scale. As I walked through the earliest detailed survey map of Yosemite (from 1883) I felt a sense of wonder. I safely explored the peaks and valleys, with no fear of dehydration or snakes. I’d love one of these for Franconia Notch in New Hampshire so I could plot out a route ahead of time. As a printmaker, I relished being able to peer closely at the inked edges of the hachuring (style of line that indicates slope). 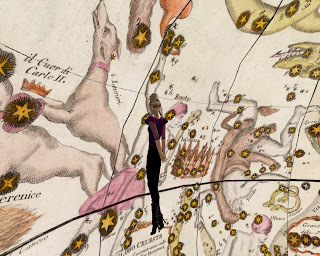 Here’s me hovering inside the Globe Terrestre, 1790 by Giovanni Maria Cassini which illustrates the routes of Captain James Cook. The celestial globe was created by Cassini, in 1792. Here I am floating over the constellation of Coma Berenice (the only constellation named after a real person) and Bootes the Herdsman.